Born and raised in Connecticut, Jeremy earned an Environmental Studies degree from from St. Michael’s College in 2016. 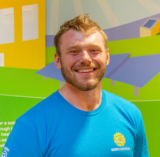 He stayed in Vermont after graduating and worked as a solar installed for two years prior to joining SunCommon. He loves to hike, snowboard, and mountain bike, as well as play some rugby now and then.